I recently visited Thailand with several friends of mine from home (Washington, D.C.) and would like to share my experiences for anyone else considering a similar trip, or for anyone who enjoys traveling in general. I hope to also offer general travel and accommodation tips as I describe my visit that may be beneficial information for others. While the several friends of mine began their trip to Thailand from home, I had begun my trip early and made a stop in Europe to visit a friend in Interlaken, Switzerland and then another friend Madrid, Spain, but that part of the trip is for another post. 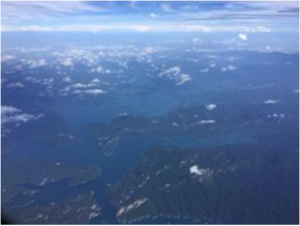 As I was in need of a flight(s) from Madrid to Bangkok during the planning phase of my trip, this is where I will offer my first general tip for booking long-haul flights such as this one. I normally use first Google Flights (https://www.google.com/flights/) when searching for flights to check availability and prices. Flights for this part of my trip were actually surprisingly cheap, starting at around $500 for the approximately 12-13- hour journey. There were, however, no non-stop flights available from Madrid to Bangkok. Since I knew I would need to pay in dollars and not points for this part of my trip (I will offer tips for using points later on), my next step was to check a favorite site of mine, staTravel (http://www.statravel.com). This is a site that offers student fares for flights, hotels, etc. and while I had only used this site while a student prior to this trip, I had read that there is no harm in booking an attractive student fare even if I am no longer a student as airlines do not check this. Therefore I grabbed a student fare for a flight from Madrid to Dubai, and then Dubai to Bangkok for about $450 total on Emirates in economy class. 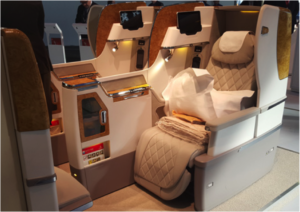 This was my first time flying Emirates and as I would later find out, the airline lives up to its hype and this was a total steal at this price. Furthermore, the layover in Dubai was less than 2 hours. To sweeten things even more, when I arrived at the airport in Madrid and stopped by the Emirates reservations counter I was able to upgrade the first leg of my flight, the overnight leg, from Madrid to Dubai to business class for about $500 more. This was totally worth it to enjoy Emirates amazing business class service and sleep almost the whole 6.5 hours to Dubai. Upon arriving in Bangkok after my journey from Madrid and then Dubai, I grabbed my luggage, hopped a cab (an experience in itself as you have to wait in line for a lane ticket outside the airport) and made the approximately 30 min. ride from the airport to the place where I was staying in the Khlong Ton Sai area of Bangkok. My friends and I booked through Airbnb for each of our accommodations in Thailand (highly recommended). 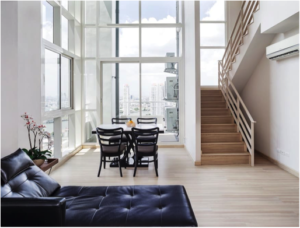 In Bangkok, we were able to stay on the penthouse floor of the Lighthouse Condominium complex in a 2-story condo. Since we all arrived in Bangkok around 9pm at night, as is common with flights from the States to Southeast Asia, we decided to get a good night’s rest and be ready to explore Bangkok first thing the next morning. Once we did get going that next morning, we wandered though some street ministries. Believe it or not the Thai sun is incredibly draining, even through the clouds, and this is about as much walking as we could do before we needed to take a break back at the condo. 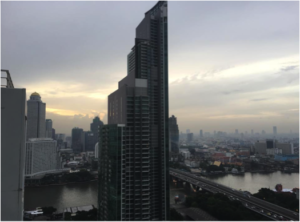 Since we all arrived in Bangkok around 9pm at night, as is common with flights from the States to Southeast Asia, we decided to get a good night’s rest and be ready to explore Bangkok first thing the next morning. 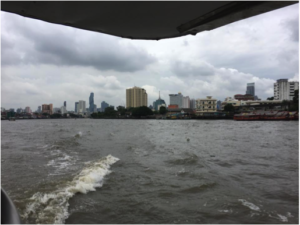 Once we did get going that next morning, we wandered though some street markets and took a quick ferry ride up river to Wat Pho and the Grand Palace. Wat Pho is a large temple famous for tis golden reclining Buddha inside, but also has a large outside area to wander around in. The Grand Palace is the former home of Thai Kings and also once housed various ministries. Believe it or not the Thai sun is incredibly draining, even through the clouds, and this is about as much walking as we could do before we needed to take a break back at the condo. 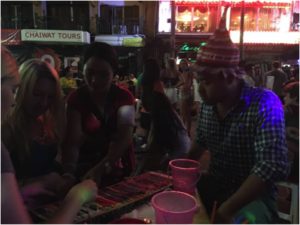 That night we decided to check out the nightlife at Khao San Road, an area lined with bars that is known for its street partying as partygoers are allowed to take their drinks outside to the street. 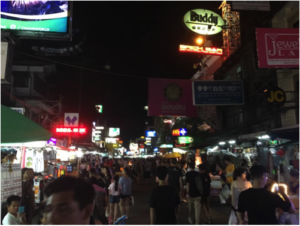 Khao San Road is a ton of fun and we all had a great time partying there until 3am or so. If this is your scene, one of the great things about Khao San Road is the very cheap liquor buckets, which sell for $4-5 per bucket and 2 of them are enough to last you all night. 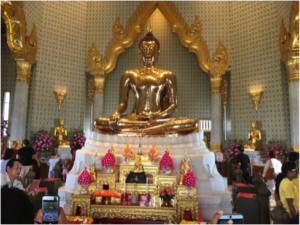 Our second day in Bangkok we picked another temple to visit, Wat Traimit, which is a beautiful white and gold temple with a solid gold Buddha inside at the top of the temple. Since it is much smaller than Wat Pho, it does not take very long to walk through the temple and visit the top before returning to the exit at the bottom of the temple. 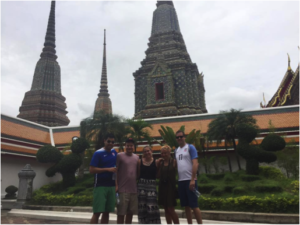 After visiting just these two temples, we quickly realized that this would be enough as all of the temples in Bangkok share enough similarities. The rest of the day involved eating lots of Thai food and saving our energy for the next day, for which we had bigger plans and an early wakeup time. Our 3rd and final day in Bangkok we left our condo at about 7am for a full day trip outside of Bangkok to Erawan National Park (https://www.thainationalparks.com/erawan-national-park). 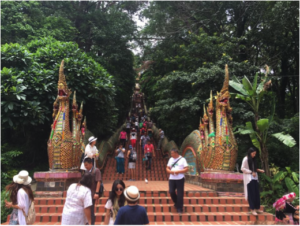 The trip took about 2.5 hours each way to and from Bangkok, and several tour operators offer different types of tours to the park. 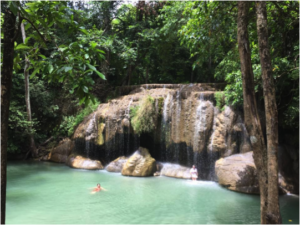 For us, we chose to hike around the many waterfalls at the park and take several dips in the water by the waterfalls to cool off along the hike. Each waterfall was beautiful in its own way, with the biggest and best waterfalls being at the top of the hike. The oddest experience about the waterfalls is the fish in the water who are harmless but will persistently nibble at your feet and legs. 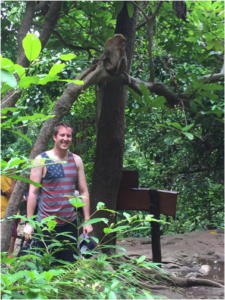 We also had the luck to run into a monkey at the highest waterfall who sat in the tree above of and posed with us for pictures. After our final day in Bangkok we caught an early morning AirAsia flight to Phuket the next morning. 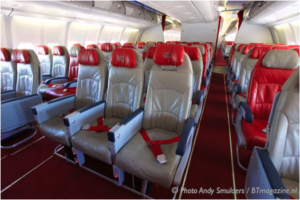 Although AirAsia is a low-cost airline, the experience was surprisingly smooth and comfortable. I’d even go as far as to say the service and comfort of AirAsia thoroughly beat out many airlines carriers operating here in the U.S., and for an almost unbelievable price of just $40 for the 2-hour flight, which even included a small meal! Count me as a fan, and I’ll be taking AirAsia again in the future. 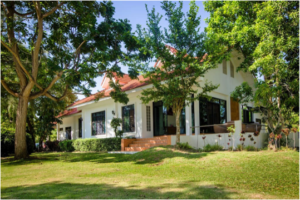 We arrived at our Airbnb in Phuket around noon that day, which was a villa owned by an incredibly nice family right on the water in the Rawai area of Phuket. Our host, Rita, was so nice and genuine and went out of her way to ensure that everything was taken care of for us during our stay in Phuket. Our first day in Phuket we just wanted to go to a nearby beach for some rest and relaxation after all of the walking we did in Bangkok. Rita knew of a beach nearby named Nai Harn Beach and even offered to drive us there herself. 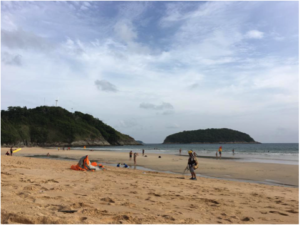 Nai Harn Beach was just what we were looking for and we spent several hours there before returning to the villa. On our way back to the villa we stopped by a local 24-hour supermarket to pick up some beer and snacks to last us the night. Back at the villa we all hopped in the pool and spent the rest of our night poolside. The next day we had decided to catch and early 8:30AM ferry to Koh Phi Phi, a popular island that is about an hour and a half ferry ride from Phuket. 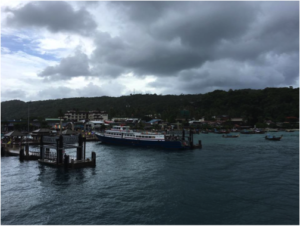 There are several companies who operate ferries between Phuket and Ko Phi Phi, and our host Rita has kindly purchased the tickets for us beforehand. During the night the weather had turned a bit on the island and it was now cloudy with scattered rain showers, which in turn has made the sea quite choppy during our ride to Ko Phi Phi. This did not bother us much however as any rain showers actually felt pretty good in the Thailand heat. 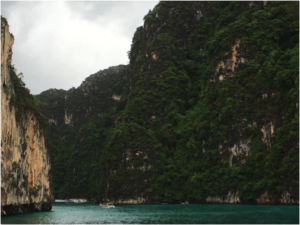 I should mention that Ko Phi Phi is actually a group of islands to the east of Phuket, and Ko Phi Phi Don is the main island to which we were headed. Our ferry captain took us around the smaller island of Ko Phi Phi Lee on our way to the main island, so we got a bit of a scenic tour during our ride. Ko Phi Phi also has the reputation of being a great party island, and as such we had planned to go out on a party boat for the majority of the afternoon that day. However, the weather continued to turn worse and the scattered rain showers turned into full-on downpours throughout the afternoon. As a result, the party boat ride was cancelled and we spent the day on the island hopping in and out of local tourist bars. The island does have a lot of charm to it, especially with the way the streets wind throughout it, many of them lined with street carts selling various items and food. We then took a break at our villa on Ko Phi Phi that we had booked, also though Airbnb, to stay on the island for the night. I can’t remember the name of the property where our villa was located, but it was just past all of the bars and shops in a quieter part of the island. Nighttime is when the real partying happens on Ko Phi Phi and after our rest at the villa, we headed back out to Carlito’s Beach bar first for a few drinks and hookah. We also got a watch a fire show and a game of limbo while enjoying our drinks. Later on we headed further down the beach to Slinky Bar for a lot of music and dancing, which easily took us to 3 or 4am before calling it a night. It would have been nice to spend another day on Ko Phi Phi as 1 day wasn’t quite enough, but the next morning we caught another 8:30am ferry back to Phuket. The rest of the morning/afternoon on Phuket was uneventful as the weather was still rainy and we were exhausted from the night before, so we basically just packed our things up and grabbed more Thai food before heading to the airport to catch our flight to Chiang Mai. Again we flew AirAsia for around the same price of $40, by far the best option available. It was another smooth and comfortable process and we arrived in Chiang Mai at our scheduled arrival time. We settled into our last Airbnb booking, a cozy 2-story house just outside of the city center. Unfortunately, I cannot find any pictures of the house so you’ll have to trust me that this was perhaps the nicest of the three Airbnb bookings and the cheapest. 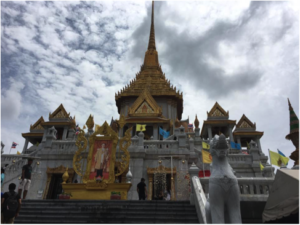 Chiang Mai gets a lot of hype as the best city to visit in Thailand and we were excited to start exploring the city. The morning after our flight we had decided to make the short trip by Songtaew (red truck taxi) up the mountain to Doi Suthep-Pui Natonal Park. Songtaews are much cheaper – amazing views of Chiang Mai can be found at a viewing ledge to the right of the entrance to the temple. The park is also home to beautiful gardens that many people visit. At the entrance to the park are numerous street carts selling hot food and fresh fruit. My favorite foods were from the carts were corn on the cob and fresh mango, which was far fresher than any mango I have ever had back home. After coming back from the national park we went straight to the Night Bazaar after a short break at our house. The Night Bazaar is a massive collection of street vendors and shops lining one of the larger roads in Chiang Mai. Basically anything you might want can be found in the Night Bazaar and it is on you to bargain the vendors down to a reasonable price, which isn’t too hard to do. There’s also at least one food court, and the one we went to had a great selection of food and drink stands. After the Night Bazaar we ended our very long day and got some rest for our next adventure. We saved the best part of the trip for our 2nd day in Chiang Mai, visiting the Elephant JungleSanctuary (http://www.elephantjunglesanctuary.com), which is about an hour and a half ride from Chiang Mai. Our 7:00am Songtaew ride there was organized by the Sanctuary and upon arrival we received a verbal introduction to the Sanctuary and the elephants. 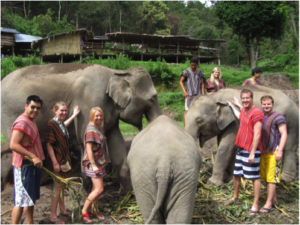 Essentially, we chose this Sanctuary to visit because the elephants are treated humanely and there is no riding on the elephants as they were not meant to be ridden and riding them can be harmful to the elephants. After the verbal in introduction, we helped carry food such as bananas and watermelon to the elephants and they ran right over to us looking for the food. Asian elephants are a bit smaller than African elephants so it was nothing too scary, and there was even a small baby elephant there who was just a year or two old. The elephants were all so friendly and just kept waiting for us to feed them more and more food, while also grabbing some of the food laying around themselves. After feeding the elephants for a good half an hour, we followed the elephants and our tour guides down to a small waterfall in a stream that runs through the Sanctuary. Here we got to bath the elephants and play around with them in the water, another amazingly fun experience. The elephants were incredibly calm and friendly the entire time and had been trained very well by the trainers at the Sanctuary. As all good things must end, we eventually had to say goodbye to the elephants and return to our starting point for a quick meal provided by the Sanctuary. After the meal, we were provided with another Songtaew ride back to Chiang Mai and arrived back around 2:00pm. I highly recommend this trip as a must-do when visiting Chiang Mai as it will be an experience like never before. That night, after taking a much longer break back at our house this time due to our early morning departure, we headed out to check out the bar scene in Chiang Mai. We had gotten a recommendation from friends to check out Zoe’s Yellow Bar so this is where we headed. I’d say this was a great recommendation as the bar had a large outdoor area and is connected with another bar right next door. This made for a great couple of hours enjoying some downtime and the nighttime air. While Zoe’s doesn’t quite live up to the nightlife in Bangkok or Ko Phi Phi, the city still holds its own. On our final half day in Chiang Mai, a Sunday, the last thing we decided to do was to rent mopeds are ride around the city for a bit. It is probably better to do your research ahead of time and find a quality moped place, but they can be rented almost anywhere so we just walked up to one of the larger places and rented them. The mopeds are very cheap to rent, about $7-8 for the entire day, and in our case we only have to show one passport at the time of rental. 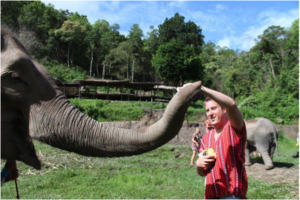 This is also and experience definitely worth doing in Chiang Mai, and also an easier way to see more of the city. Finally, when it was time to head home I first took a Dragonair flight to Hong Kong that afternoon. Dragonair is operated by Cathay Pacific and had one of the only nonstop flights from Chiang Mai to Hong Kong. 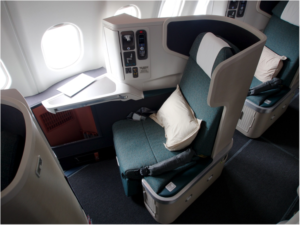 I would be flying Cathay Pacific back to New York and since Cathay Pacific is based in Hong Kong, I first had to fly there. I booked my Cathay Pacific flight using British Airways Avios, and since the two airlines are partners I could do this through the British Airways website. 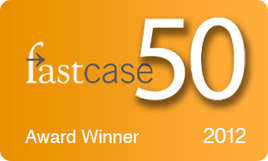 For just 40,000 Avios I was able to book premium economy class the entire length of the trip, which had a short 50 min. layover in Vancouver on the way to New York. I had earned these points mostly though using my Chase Sapphire card, and had then transferred the points to British Airways at a 1:1 ratio. I considered this to be a great use of points for the approximately 16 hours of total flight time. To sweeten the deal even further, Cathay Pacific upgraded me to business class for the flight from Vancouver to New York at no cost as the flight was not at all crowded. While I was sad to be leaving Thailand and returning back home, th return trip was about as comfortable as I could have hoped.